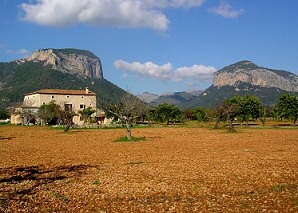 The silhouette of the almost symmetric mountains of Alaró (822 m) and Alcadena (816 m), situated one opposite the other, are the most outstanding images of the municipality of Alaró. The Alaró Castle, located on the top of the mountain of the same name, is an ancient fortification dating back to the Moors. The Alaró mountain, that offers beautiful views over Mallorca as far as the Palma and Alcúdia bays and the Tramuntana mountain range, also holds from the XVII century the Mare de Déu del Refugi sanctuary and a hostelry. To visit the mountain you have to reach the Alaró town and then continue towards the Orient valley until you find the road leading up to Castle, with its corresponding sign. Following this road you will reach the Es Verger houses, where there is a restaurant and a parking area. The walk starts at this point and continues until Es Pouet, where the old stone path begins, the only way to reach the door of the impregnable castle. The history of the Alaró Castle is connected with Guillem Cabrit and Guillem Bassa, the stars of the legend that took place in the Alaró castle at the end of the XIII century, who died burned after bloody fighting against the troops of King Alfons II, defending King James II of Mallorca. The hostelry of the castle offers bedrooms, a bar and a restaurant and it is open all year. More information and bookings: 971 940 503. The Alaró Castle, and the land that includes this historic and archaeological building, belong to the familly Ordinas Pou, except the Mare de Déu del Refugi sanctuary and the hostelry, which are managed by the Fundació Castell d'Alaró.